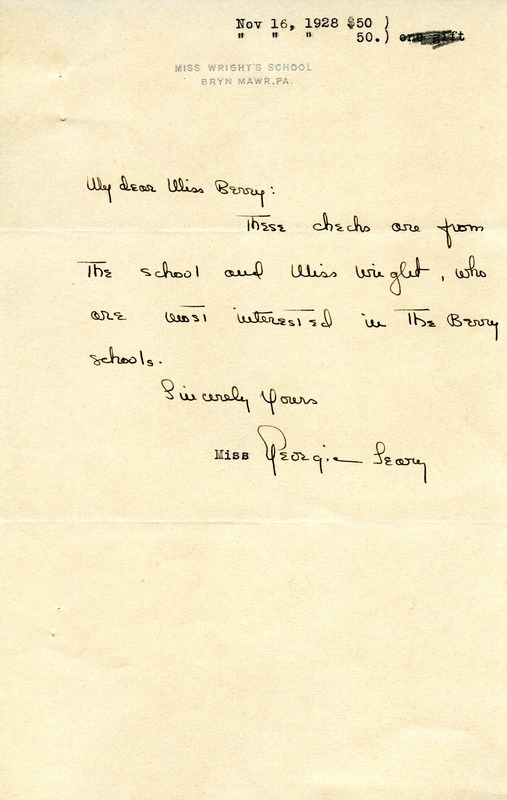 Miss Georgia Leary wrote to Martha Berry to deliver checks and relay a message that Miss Wright is interested in The Berry Schools. Miss Georgia Leary, “Letter to Martha Berry from Georgia Leary.” Martha Berry Digital Archive. Eds. Schlitz, Stephanie A., Garrick Bodine, Kathryn Saulinas, et al. Mount Berry: Berry College, 2012. accessed April 26, 2019, https://mbda.berry.edu/items/show/9360.